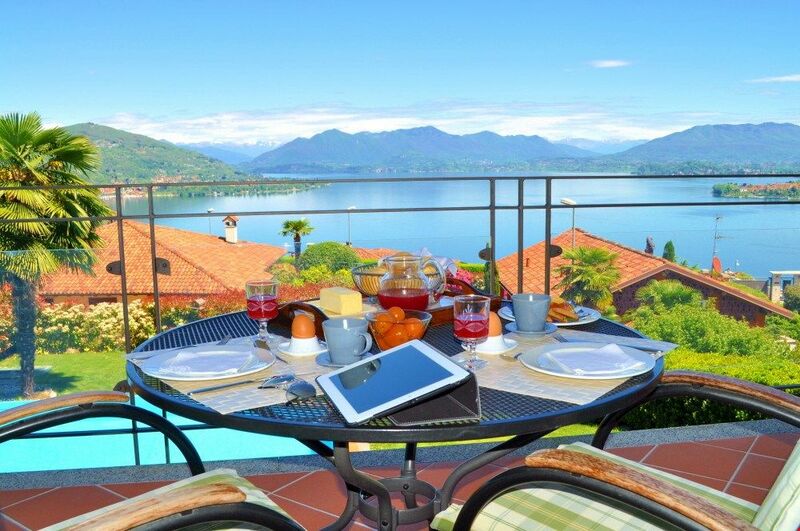 Stay at this lovely modern villa and experience the joy and beauty of Lake Maggiore, the largest in the “Lakes District”. Lake Maggiore offers visitors spectacular gardens, historic castles, and medieval churches. Numerous nature parks can be found throughout the area, including the enormous Parco Nazionale dell Val Grande. In the center of the lake, north of Meina, take a boat excursion to the enchanting Borromeo Islands, which hold magnificent palaces and gardens. (750 m2) A large fenced garden boasts panoramic views of the Lake and mountains. Included is a patio with table and chairs for outdoor dining, a barbeque, expansive lawns and a private swimming pool, (9m x 5m, Open May to end of September). As well as garden furniture and lounge chairs, there is also play equipment for children including a slide, swing, and playhouse. There is private parking for 2 cars on the premises - one in the garage and the other inside the property. Another space is available on the street. This 2 story villa is beautifully decorated with bright, modern interiors. Ground Floor: The fully equipped, modern eat-in kitchen has seating for 5, a dishwasher, microwave, oven, range, fridge and freezer. There is a spacious separate formal dining room with seating for 10 people. The patio, pool and garden are accessible from this floor via double French doors. There is a bathroom with a shower, and a laundry room with a washing machine only. There is also a double bedroom with queen-size bed (160 cm) with window screens and a portable AC unit. First Floor: Up 15 steps, is the modern living area with a large sectional sofa and Satellite TV. Adjacent, is another sitting area with comfortable chairs. This area leads to the terrace offering magnificent views and an outdoor dining table with seating for 4. All 4 bedrooms are located on this level. The master bedroom has a 180 cm king sized bed, (beds cannot be separated), and ample closet space. There are three additional double bedrooms, each with 160 cm queen beds, (only one of the beds can be separated to make 80 cm singles upon prior request). The 4th is a cozy children’s bedroom with two bunks beds. On this same floor are three bathrooms, one with a tub only, the other two with enclosed shower. All the windows have screens. Upon prior request, the two queen-size beds can be separated into narrow twin beds. Additional Bed: An additional single bed can be added to the bedroom with the bunk beds. There is no additional cost, but it must be requested in advance.